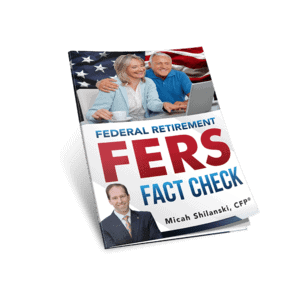 Hi, I’m Micah Shilanski from Plan Your Federal Retirement. We just wrapped up a wonderful two days of teaching an eight-hour class about federal benefits. When we went through the class, the participants had some great questions on how your benefits work, and I thought I’d share several of those. Number one, there’s a lot of talk about a RIF, a Reduction in Force. If that happens, how does it impact you and how do you prepare for it? There are two things that I want to mention in this video that you need to be thinking about in preparation for a RIF. The first is your FEHB, Federal Employee Health Benefits. FEHB is by far T.H.E. B.E.S.T. benefit that you have as a federal employee. Why? Because it is great health insurance! The government pays around 72% of the premium and you are responsible for about 28% of the premium. FEHB has an open season at which time you can move in and out of the coverage and change your options. However, if you are RIF’d and you’re not able to retire, that means you may be ineligible to keep FEHB. However, there is “TCC”, Temporary Continuation of Coverage. This allows you to keep your FEHB for a limited time, about 18 months after you have separated from service under a non-retirement. The downside with Temporary Continuation of Coverage is you have to pay 102% of the premium. Remember, most feds pay around 28% of the premium. If your health insurance premium goes from you paying 28% to 102%, can you afford that or budget it in accordingly? An option that you have during an open season is to look at a high deductible plan and making changes to your plan up to reduce the cost if that makes sense for you personally or as a family. Being able to keep your health insurance, generally, is pretty important even during a RIF. The second item for Fed’s is their cash savings. The funny thing about savings, most feds when I’m working with them, they put all of their money that they into the TSP. I love the TSP, don’t get me wrong. It’s a great tool for investments, but it’s not a savings account. There’s a little bit of a difference between a savings and a retirement account. If you get RIF’d or you separate from the feds before the age of 55, you are not able to access your TSP without a 10% premature distribution penalty. In addition, you will pay taxes on the income that you are tax out as well and that can be pretty punitive. So, what I want to see is my feds have three to six months of living expenses saved. How much does it cost you to live? It will cost you $4,000 a month. Four times three, twelve thousand. You need $12,000 to $24,000 in the bank, in an account that you can access that doesn’t go up and down with the market. This account I do not want locked up in a retirement vehicle like the TSP where the rules are punitive because you’re too young to access it. You need money in a bank. Having savings is a key difference between transitioning or surviving a RIF. I hope this information has been a benefit. For more information, please go to our website, plan-your-federal-retirement.com.